After six years of no litters, Choice Bluestocking (“Lulu”) delivers a beautiful litter of 12 healthy puppies. The results for the Afghan of the Year competition for 2002 are in. Ch. Choice Custom Built placed 4th and Int. Ch. Choice Agent-00-Seven placed 8th among the males. Agent-00-Seven was also top male Veteran of the Year. Choice Cruise Control gains his last CC at the Sighthound Specialty Show in Kaarina under Estonian breeder-judge Irene Naarits (kennel Oshanameh). With this win, “Vincent” finished his Finnish Championship and became the kennel’s 48th champion. 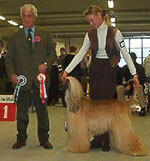 Choice Bluestocking wins the breed at Turku International Show from the open class under Italian judge Paolo Dondina. 58 afghans were entered, including most of the recent top winners in Finland. With her win, “Lulu” secured her first CC and CACIB. Only shown four times so far, look for her in the rings this summer.